Like the previous entry, this one too was read quite awhile ago. Ahh, dwarfs or dwarves, Whatever you like to use. I love ’em. Put ’em in a game, a book, a RPG, and I will be drawn to them. I don’t know why, but dwarfs fascinate me in literature. And I particularly like the lore that Games Workshop has worked around their dwarfs in their universe. Grudgelore is just, really, a collection of short stories around various grudges that need to be resolved by particular set of dwarves we are following. 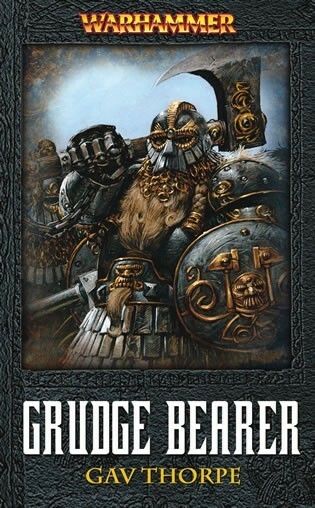 If you are not a fan of Warhammer dwarfs, this book may be hard to follow or even to enjoy. The book assumes that you are a fan of the universe that is being played in and assumes you know certain things. What the skaven are. What the greenskins are. If you are not a fan of this universe, there is very little here to like. This book is less than 300 pages, so there is not too much to say about it overall. I liked it, but I don’t think you average every-day reader would much here to like. However, if you are fan of dwarfs of the Warhammer ilk. Pick this up. This entry was posted in Reading and tagged dwarf, dwarfs, fantasy, gav thorpe, reading, warhammer. Bookmark the permalink.